Interested in releasing baby turtles in Cancun? It's such a magical and educational experience! 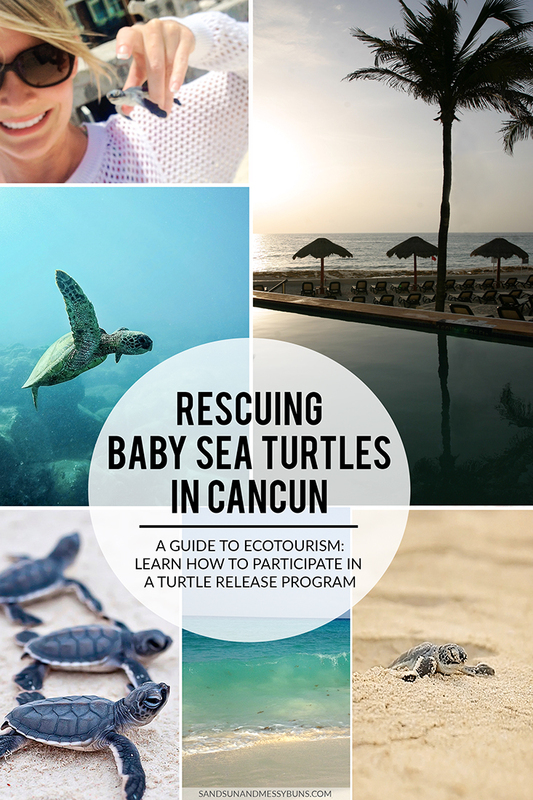 Many of the local hotels in Cancun have partnered with conservationists to create a highly informative sea turtle rescue program where resort guests can gather nightly to assist in releasing baby sea turtles into the turquoise blue waters of the Caribbean. I had no idea this program existed and was pleasantly surprised to discover it during a recent trip to Cancun. FTC Disclosure: This post contains affiliate links, which means we’ll receive a small referral fee at no cost to you. You can read our affiliate policy here. Imagine my delight as I was dining at a beachside restaurant and glanced up from the table to see a giant sea turtle digging a nest on the beach less than 100 feet from where I was sitting! At first I thought my eyes were deceiving me and that I was looking at a child digging in the sand (it was dark, after all). I quickly realized it was a real live “tortuga”. I got so excited that I leapt up from the table, muttered something about my bucket list to my best friend, Christopher, and then darted off to take pictures. Thank goodness he knows me well enough to know I do things like that fairly often! [Photo source] Sea turtles are amongst the most peaceful and beautiful creatures I've ever seen. I quickly learned that viewing a sea turtle as she nests is one of those times in life where you have to be fully present in the moment. There's no need for a cell phone or a camera; simply enjoy taking it all in. If a turtle becomes frightened during the nesting process, she will turn around, abandon her efforts, and head back to sea without laying her eggs. The sea turtle numbers are in steep decline, so abandonment is the last thing anyone wants! FUN FACT: Did you know marine turtles have been in existence since the dinosaur age? It's very important to follow certain rules if you're fortunate enough to see a turtle nesting. Don't point a flashlight towards her. DO NOT use flash photography. This is so important, yet I saw so many people getting too close and then making it worse by taking photos with a flash. Keep your voice down, as noise is also distracting to them. Help keep their nesting environment clean by using biodegradable sunscreen when utilizing the sandy beach areas during the day. Always avoid littering (just a good practice in general). A sea turtle is least likely to abandon her nesting efforts once she has already dug a hole and is in the process of laying her eggs. However, it can still happen! More often than not the nesting efforts are abandoned prior to the laying stage, because a turtle will become startled by tourists getting too close as she attempts to reach the perfect nesting ground. FUN FACT: Did you know that many species of sea turtles return to the same area where they were born when it's time for them to nest? Once a turtle has nested — a process that takes approximately 2 hours — she then heads back out to sea. Specially appointed “turtle guardians” from the conservation program arrive on the beach very early each morning to locate the nests, dig up the eggs, and then relocate them to a fenced area near each participating hotel. 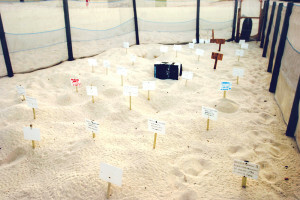 The fenced areas each contain numerous nests, along with markers noting the dates the eggs were laid and their anticipated hatch date. The eggs go through a 50-60 day incubation period prior to hatching. Sea turtles lay approximately 100 – 200 eggs each, depending on the species. The turtle guardians are very friendly! Their main goal is to educate guests about turtle conservation efforts, so they're happy to answer tourist's questions. Note: In many U.S.-based rescue programs, conservationists leave the nests in place but rope off the nesting area. I awoke early the following morning to catch a sunrise and made my way down to the fenced area. I was delighted to see a newly hatched batch of turtles! (They typically hatch overnight.) Their guardian was already there, counting each turtle and making notations. The fenced in area where the eggs can incubate safely. If you look closely, you'll see tiny turtle tracks everywhere! 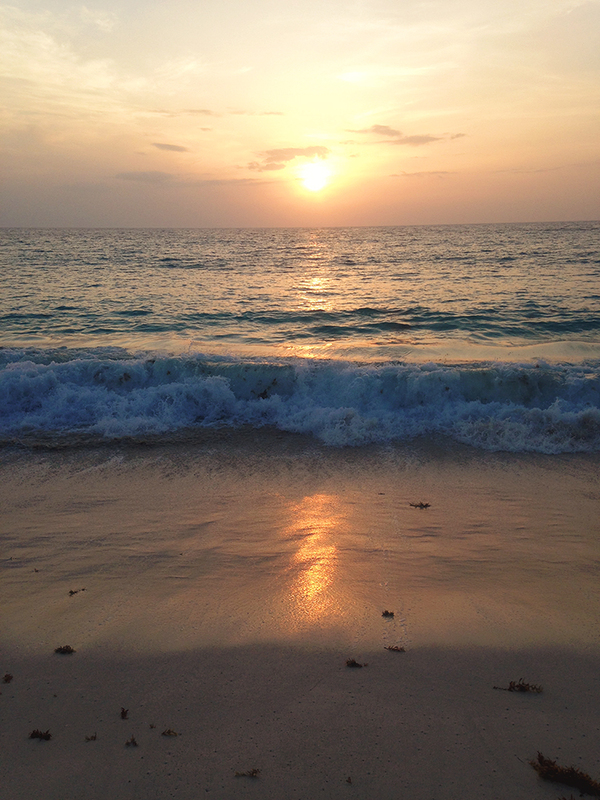 The sunrise in Cancun was beautiful! The turtle guardian explained to me that they collect the turtles hatched during the night, as well as any hatched during the daylight hours, and store them safely in a shaded area until nighttime. The bright sunlight, unbearably hot sand, and numerous tourists exploring the beach during the daylight hours are detrimental to the hatchling's safe journey to the sea. Their chance of survival increases when released at night, because there is less chance of them being spotted by predators. Click above to see my quick cell phone video of the hatchlings born during the night. The chatty turtle guardian informed onlookers that interested hotel guests should gather in an area on the beach between 2 yellow flags at 8 p.m. to release the hatchlings. Um, yes, please! Sign me up!! I was so excited I could barely contain myself. My enthusiasm must have been contagious because Christopher quickly agreed to join me. Upon gathering in the evening, the turtle guardians began passing out baby turtles. Each person standing between the yellow flags received one to release. I'd estimate there were approximately 100 people in our group. Our guardian explained that when there aren't enough turtles to go around, children are given the highest priority. Fortunately, our guardian had more than 100 turtles in need of release! She informed us that we'd count to 3 and release all hatchlings at at the same time. (Turtles have an increased chance of survival when released in groups.) They also do better when released during a full moon, which we happened to have that evening. Seamore's excited to swim for the first time! Our guardian instructed us to count backwards from 3, then we released the hatchlings and cheered them on as they flipped and flopped out to sea. It was so cute to watch them! I was so busy enjoying the moment that I didn't attempt capturing their release on video in the dark. However, I highly suggest searching “baby turtle release” on YouTube if you ever need a reason to smile. Our turtle guardian explained that only 1-2% of hatchlings survive to adulthood and are able to mate to carry on the species. That's why turtle conservation efforts are so important! We spotted birds diving in the dark in an attempt to capture our little tortugas. We crossed our fingers and prayed that Seamore and Daisy II wouldn't become a late night seagull snack. I suggest inquiring with your hotel when making reservations to see if it's one of the participating resorts. Even if your hotel isn't participating, you can see turtles nesting all along the beach in the evening. They begin around 9:30 p.m. and next throughout the night. 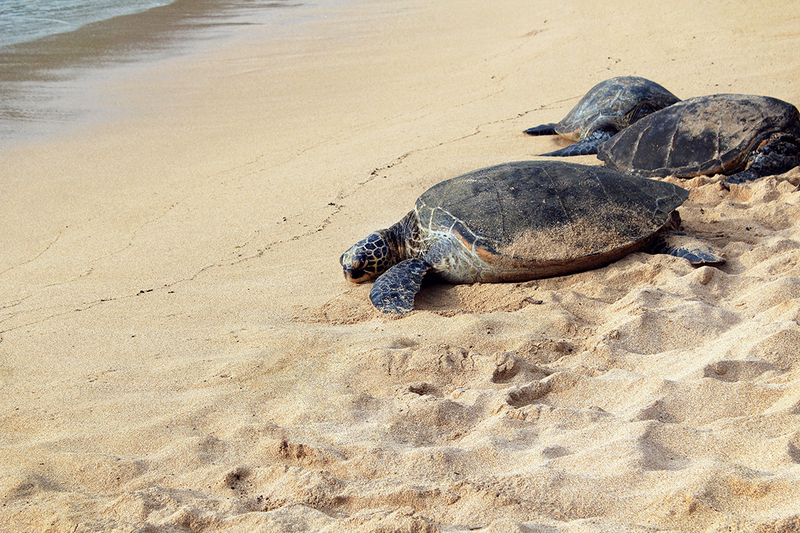 The turtles nest during the summer months and the hatchlings journey out to sea through late October. There is no charge to do any of the above activities! Read the reviews on Trip Advisor. Read more about their efforts here. 1. The Royal Sands in Cancun | All Inclusive | Read the reviews on Trip Advisor. 2. The Royal Islander in Cancun | Read the reviews on Trip Advisor. 3. The Royal Caribbean in Cancun | Read the reviews on Trip Advisor. Read more about their efforts here and here. To learn more about sea turtle conservation, visit the Sea Turtles Conservancy website. If you have any questions about releasing baby turtles in Cancun, please let me know in the comments and I'll do my best to answer. I highly recommend this activity for children and the young-at-heart. Another fun activity we tried while in the Yucatan Peninsula was swimming inside a cenote, which was a very unique experience! Hi Else! You’re right…the season is definitely over. I don’t know if there will be any hatchlings at all next week, but you could certainly ask at the concierge desk when you arrive. If there were any turtle sightings this late in the season, I’m sure they’d know. I really hope you’re able to see at least one! It’s such an incredible experience. 🙂 Good luck! Can you participate in the release of the baby turtles if you are not staying at one of the listed resorts? I already booked my hotel a couple months ago and unfortunately it’s not on this list. “sigh”. Hi Diana! You’ll be at the tail end of the season in October, but you could certainly inquire at the hotel’s front desk to see if they still have any activities in which you could participate. If not, it’s definitely worth calling the front desk of the other hotels listed above to see if they have any turtles to release! There probably won’t be as many baby turtles as there are during the peak summertime months, but if you’re diligent and check around hopefully you’ll find some. Good luck! It’s such an incredible experience. Can you please send me info who who I can contact to arrange travel plans to release baby turtles? I have three daughters that would so deeply appreciate the experience. Hi Mike! That’s so thoughtful of you to take your daughters on a trip to release the turtles. 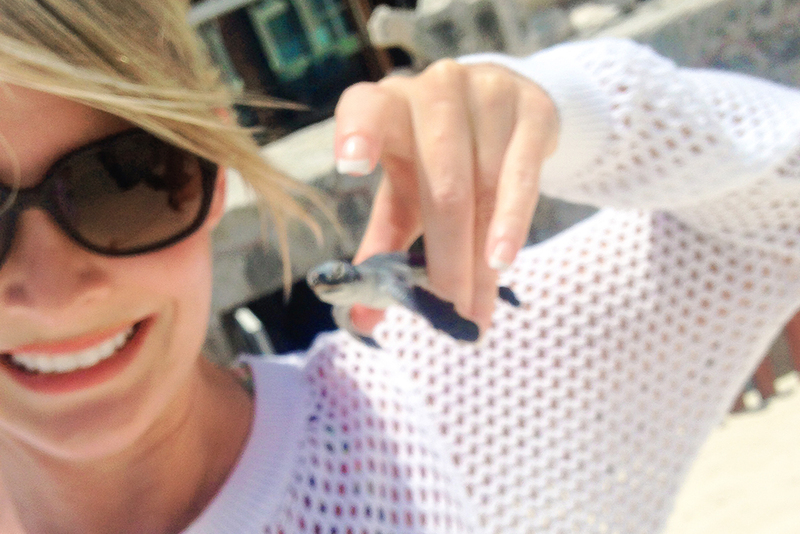 I’ve updated the post to reflect a current list of hotels that offer turtle release programs. Remember…if you want to see the turtles nesting you’ll need to watch late at night (so maybe have them nap during the day?) 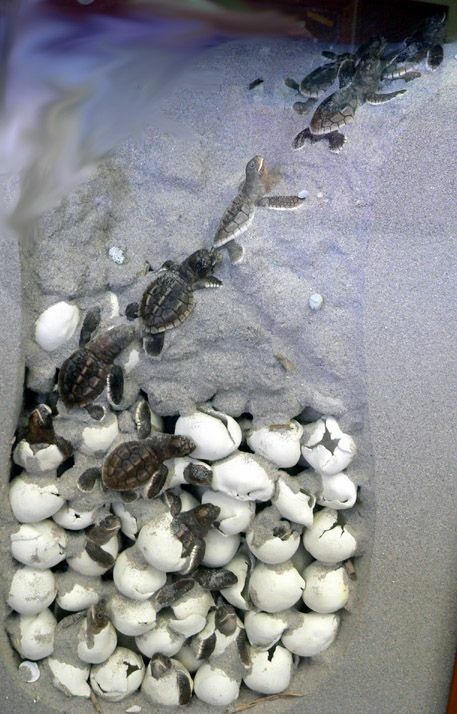 during the late spring to early summer months and if you want to see the hatchlings being born that happens more towards mid-summer through early fall. 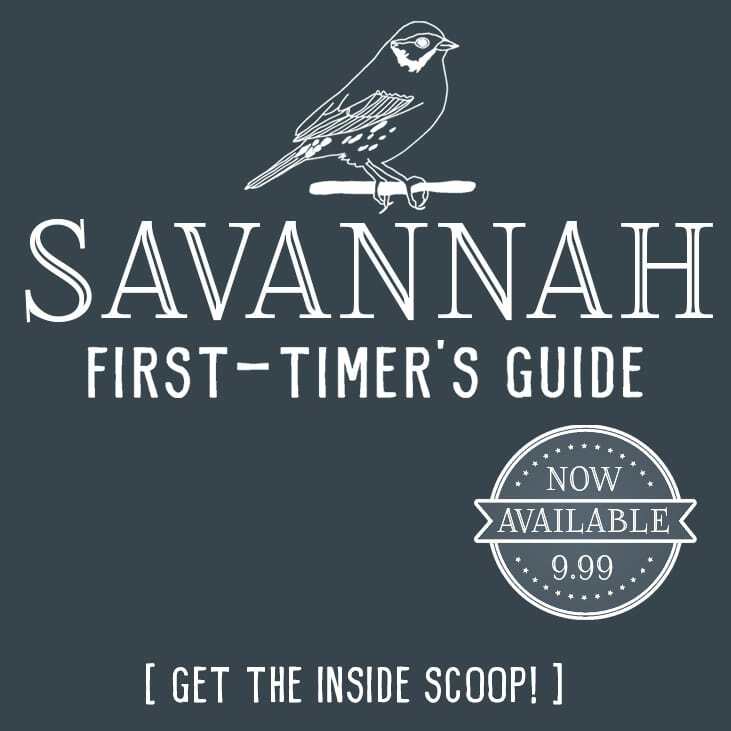 I went the last week in July and I was fortunate to see lots of both (nesting and hatchlings), so I’d suggest that as the most magical time to take your kids. 🙂 Have fun and safe travels! Hi, Can you recommend a hotel that you know that offers this service and what time of year i visited cancun but unfortunately it seemed to be the wrong time of year and no one had a clue what i was talking about when i asked. Hi Danielle! I stayed at The Westin Resort & Spa Cancun, so they should definitely be aware of the turtle programs because they offer them. 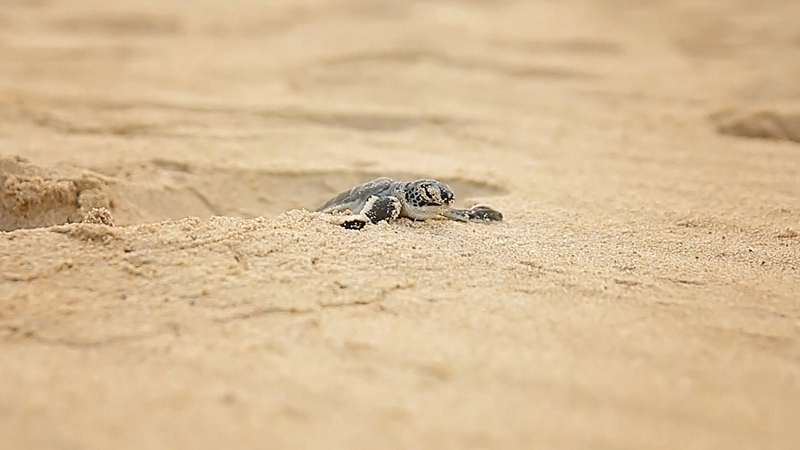 I also found this link to the Omni Cancun’s sea turtle rescue program: https://www.omnihotels.com/blog/omni-cancun-sea-turtle-program/ Finally, here is a link to the Ritz Carlton Cancun’s turtle release program: http://www.ritzcarlton.com/en/hotels/mexico/cancun/area-activities/activities/recreation/baby-turtle-release I hope that helps. I’ll edit the article to include the info, too. We are planning a destination wedding in Grand Bahia Principe Tulum in early August. There will be quite a few children there, and we were wondering if there is likely to be any turtle activity during the time we will be going. I am behind. I just now reading this. What a neat experience. I love turtles. In fact my one & only tattoo is a turtle (got it in Hawaii)! Add this to my bucket list.